Our founder and director Alison Shan Price MBE delivers the first of her series of lectures on British female explorers in the Middle East (1880-1940): Explorer, author and agent, Dame Freya Stark. Alison performed the role of Freya in Hooda Shawa’s monodramas for TAQA Productions, based on the life of Dame Freya for The International Monodrama Festival, 2016 (directed by Abdulaziz al Haddad) and the DAI 23 Cultural Season, 2017 (directed by Diana Sfeir) and will again in August 2018, in UK. In December, we presented the Stephen Sondheim musical SWEENEY TODD- THE DEMON BARBER of FLEET STREET @ The Live Theatre between 7-10 December. Musical Director Richard Bushman (Don Giovanni, The Pearl Fishers, Verdi’s Requiem) conducted an orchestra of 9 musicians and an ensemble of 60+ including the choir of AMG. Alison Shan Price directed the show with Hamad al Jenaie as Artistic Director and producer and Diana Sfeir as Designer and production manager. The role of Mrs Lovett was played by Comediene and professional singer Balqis duVal. AUGUST, UK: THE BLUE BOX -MEMORIES OF THE CHILDREN OF WAR . The 5 star-rated International Premiere@the Edindurgh Festival Fringe. Shortlisted for the Zeigeist Fringe Award, the production was a UNICEF Fundraiser. MAY: William Shakespeare’s comedy The Merry Wives of Windsor – Commemorating the 400th anniversary of William Shakespeare’s death @ The British Embassy. Director- Alison Shan Price. OCTOBER: A Second Night In The West End @ The British Embassy Gardens, a tribute to Culture is Great. AUGUST, UK: Antigone: An Arabian Tragedy @ The Edinburgh Fringe Festival 2015. Kindly sponsored by Al Ghanim Industries (Gold Sponsor), The DAI Cultural Centre (Gold Sponsor), The Crowne Plaza (Silver Sponsor) and Friends of One World. Nominated for the Amnesty International Fringe Award. For details of its development please refer to its own page. MARCH: A Little Princess. A One World Youth Theatre Production in association with Bayt Abdullah Children’s Hospice, Creative director /producer-Eleni Price. FEBRUARY- APRIL: The National Tour of Antigone. Adapted from the version by Jean Anouilh in English (Roman-invaded Britain 02AD) and in Arabic (1990 Invasion of Kuwait) The Tour culminated at DAI Amricani Cultural Centre as part of its 20th Season under the National Council of Culture, Arts and Letters. ‘The English and Arabic versions of the production proved so successful with audiences that they have since been combined to form Antigone: An Arabian Tragedy, which will be debuting at the Edinburgh Fringe Festival (Scotland, UK) in August 2015. Performed at the Live Theatre in Kuwait, Andrew Lloydd Weber’s musical Evita was a sell-out, musical extravaganza. Performed by a cast of 50 adults and children, it featured international opera singer Dr Oana Severin as Eva Peron, national actor and singer Hamad Al Jenaie as Che and international singer and Musical Director Mike Ricketts as Peron. Directed by Alison Shan Price, Maestro Richard Bushman conducted the 9 piece orchestra. The show was choreographed by Eleni Price and Yousef al Nasser. Director-Alison Shan Price. Music Director-Mike Ricketts. Vocal Coach- Olwyn McCollin. A medley of West End melodies was performed under the stars on two sell-out nights at the British Embassy Kuwait. Featuring 16 international singers, the event accumulated with , a silver service meal provided by Crowne Plaza. MARCH: Alice In Wonderland: Steampunk Revolution @ The Performing Arts Centre, TES. Kindly sponsored by Al Ghanim Industries. Creative director/producer-Eleni Price. MARCH: Shakespeare’s Much Ado About Nothing: 3rd Annual Shakespeare Festival Production @The British Embassy Kuwait. Festival and production director- Alison Shan Price, producer- Eleni Price, choreographer-Augustine Tchantcho. This CS Lewis extravaganza included a life sized-‘lion’ and snow as the 4 children go through the Wardrobe into Narnia. Costumes and animal creations were created by One World Craftshop. OCTOBER: The Woman In Black @ Boxhill College. Directed and produced by Hamad al Jenaie and Alison Shan Price. APRIL: The Roald Dahl Musical @ The Performing Arts Centre, TES. Kindly sponsored by Al Mullah Exchange and Al Abjar Holdings. Director and choreographer – Yousef al Nasser. Yousef Al Nasser’s sparkling directorial debut saw One World Youth Theatre pay tribute to Roald Dahl’s beautiful children’s classics, including James & The Giant Peach, The Twits & Matilda. Performed at the Performing Arts Centre at The English School, Kuwait, it delighted audience goers of all ages and featured Maya & Jana El Diwany and Charlotte Kolega as Matilda respectively. 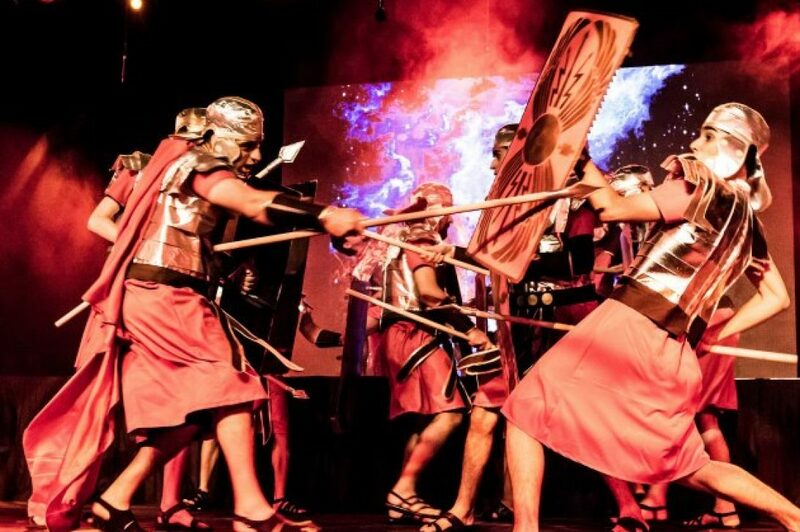 MARCH: William Shakespeare’s Julius Caesar: 2nd Annual Shakespeare Festival @British Embassy Kuwait. Festival and production director-Alison Shan Price and Associate director, fight choreographer and director of craftshop- Nader Abdullah.